After a successful run at New Jersey’s Paper Mill Playhouse last fall, Disney’s Newsies has finally found its way to Broadway. Opening on Thursday, April 29 to rave reviews at the Nederlander Theatre, Disney Theatricals has announced that the musical, which originally was scheduled for a limited run, would now have an open-ended Broadway run. When it opened at the Paper Mill Playhouse, it generated such excitement and interest that the show was playing to packed houses every performance. Inspired by the 1992 film of the same name, the stage production keeps the essence of the film with some new additions including seven brand new songs by Alan Menken and Jack Feldman while keeping many of the songs, including “Carrying the Banner,” “Seize the Day,” “King of New York,” and Santa Fe,” that made the film a cult favorite in the first place. The Broadway company of Newsies features Jeremy Jordan (Bonnie & Clyde) as Jack Kelly, John Dossett (2003 revival of Gypsy) as Joseph Pulitzer, Kara Lindsay (Little House on the Prairie) as Katherine Plumber, Capathia Jenkins (Caroline, or Change) as Medda, Ben Fankhauser (Spring Awakening national tour) as Davey, Andrew Keenan-Bolger (Mary Poppins) as Crutchie, and Lewis Grosso (Mary Poppins) and Matthew Schechter (Elf) alternating the role of Les. 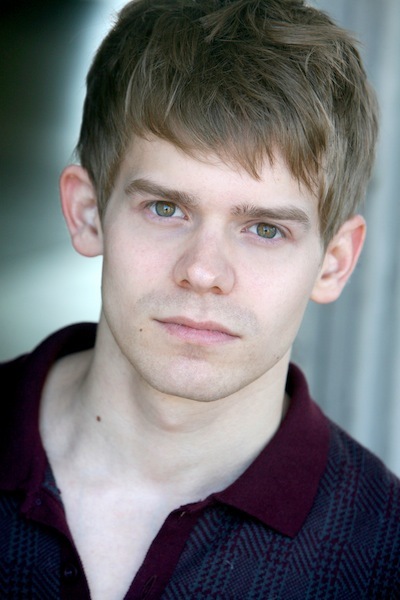 A number of the cast who originated their roles in the Paper Mill Playhouse production have reprised their roles again on Broadway including Andrew Keenan-Bolger, who plays Crutchie. A native of Michigan, Andrew, 26, has been a number of musicals already including the original cast of Seussical the Musical, Beauty and the Beast, and A Christmas Carol. He also originated the role of Robertson Ay in the first national tour of Mary Poppins and then took over the same role in the Broadway production. An avid filmmaker, Andrew has a webseries, “Submissions Only,” as well as filming backstage exclusive videos and interviews for Disney Theatricals. Andrew also has a blog, www.thisisandrewsblog.com and a personal website, www.andrewkeenanbloger.com. 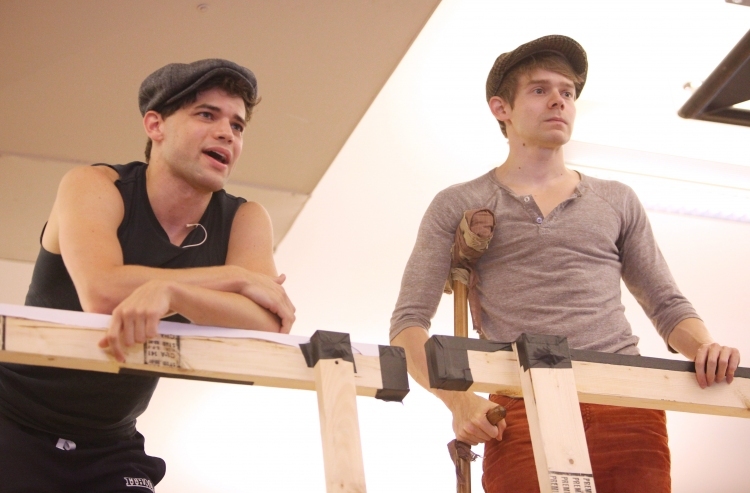 The following links are a few of the Newsies videos from Disney Theatricals: The Newsies Take The Nederlander Theatre for the first time and Meet Andrew Keenan-Bolger as Crutchie, as well as the Broadway opening night curtain call and the recording of the cast album. The Disunplugged recently caught up with Andrew and talked to him about his role and the process behind Newsies. Were you familiar with the movie prior to your audition? Absolutely! I was a big fan of the movie growing up. I actually saw it in the theatre, which was a bit of a rarity considering it wasn’t a big success for Disney at the time. I was also asked to take part in the first two readings when Disney first decided to adapt NEWSIES for the stage. I think the idea of younger generations banding together and standing up to a seemingly impossible cause was what most attracted me to this project. 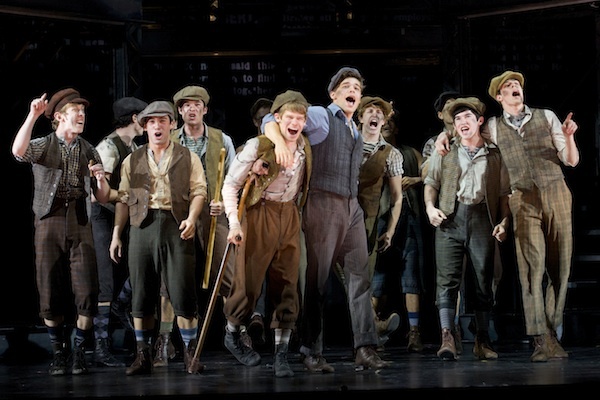 I think there’s been a trend among shows to have youngsters acting really angry and tortured which is compelling to a point, but the boys in NEWSIES are the opposite of angry…they’re full of passion! Seeing boys fighting for something they believe in is so invigorating as an audience member. How would you describe Crutchie? Crutchie is an eternal optimist. Despite his many hard knocks, he remains so positive and a true symbol of hope. That being said, my Crutchie is a bit of a departure from what I think a lot of people are expecting from the crippled newsboy. He’s not this super sweet, fragile boy. Historically, these boys were a lot more hardened by their poverty and lifestyle. So despite his handicap, he tries to be a real tough guy and wise-cracker. While I think it’s easier to play him as precious and sympathetic, I think it’s more rewarding for the audience to see someone trying to uphold this tough exterior until his surface cracks and he truly needs help. What was the initial rehearsal process like? For our run at The Paper Mill Playhouse it was a relatively short rehearsal process. We were in the rehearsal studio for three weeks and then teched the show in a week and a half. Because we were doing it regionally we had less time than a typical Broadway show so it was a very taxing process. The Broadway rehearsal process was even shorter and more strenuous but I think it’s what brought us together. Working in the trenches with your castmates proved to create an impermeable group of boys. We truly became a family. How did Chris Gattelli’s choreography guide your character given you have to move and dance with a crutch? It was very important to Chris and me that we honor Crutchie’s disability. We didn’t want the magic of musical theatre to make him suddenly be able to break out and start doing a dance break, so any of the movements that I do takes into account my bum leg. We had to modify a lot of the dancing to make sure that my right leg was never weight bearing. It was a great exercise figuring out how to maneuver my way through the show. I understand that Alan Menken has added some new songs to the musical, but has Harvey (Harvey Fierstein was the book writer) added, changed, or deleted any scenes or dialogue as it related either to you or the other characters? Across the board, the lyrics, music and book have been reworked for our Broadway transfer. Since the audience was responding so well to the show during our out-of-town run, there haven’t been any drastic changes. However, they did want to make sure that the Broadway production would be the best possible version of the show. What’s the dynamic between Crutchie and Jack? I think one of the biggest improvements in the stage adaptation is the strengthening of the relationship between Jack and Crutchie. Jack really looks out for Crutchie probably because neither of them have family, so they are more like brothers than friends. Jeremy (Jordan) and I open the show with a very small and intimate scene. I think people expect to be immediately blasted with a big dance number with flips and athletic moves, but honing in on the characters right off the bat and seeing how much these boys care for each other sets up the show perfectly. As an audience member you realize that this isn’t just going to be a show about tricks and production numbers, it’s going to be about relationships and storytelling. 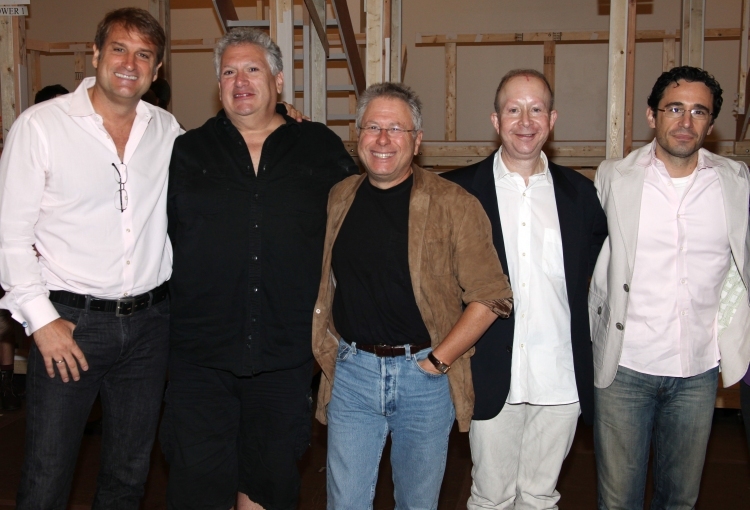 Has Marty Belafsky, the original Crutchie in the movie, seen the musical yet? Have you heard from him at all about your performance? To my knowledge he hasn’t seen our show. I’d love to meet him! I totally grew up on his performance and remember saying even at an early age that if they ever did an adaptation of NEWSIES that I would totally want to play Crutchie. As an actor, how do you feel about taking a character that already exists on film… and a cult film at that? I got to say, I should probably feeling a lot of pressure, but I’m so freaking excited to be a part of this that I’m feeling only joy! If you had told a 12-year-old Andrew that when I grew up there would be a NEWSIES musical, I would have been so excited, but if you told me I was going to play Crutchie in the original cast, I probably would have passed out. Did the film provide a base for your character or did you bring a few new things or something completely new to Crutchie? Certainly seeing the movie so much as a kid made the performance more or less engrained in my body but I had to force myself to not go back to the film version once I got the part. I didn’t want people to come to the show and see exactly what they could just watch at home. Crutchie in the film is so goofy and lovable and while my Crutchie is hopefully both of those things, I wanted his involvement with the strike to be what ultimately brings out those characteristics. Luckily, Harvey and Jeff have done some incredible work to preserve what was magical about the movie, but also give us room to create depictions that are truly our own. The movie has become a cult hit, despite its poor showing when the movie was released. Given the fact that so many people know this movie and its music did the creative team’s changes to the story and some of the characters make your job (and others) easier or difficult? I know a lot of people come to the show expecting to say all the lines and sing along with every song, but there’s definitely some new elements. The essence of the film is certainly intact but you have to remember that Alan Menken and Jack Feldman have twenty years more experience under their belts today than they did when they were writing the film. It seems natural that they should want to improve on their work and make it geared towards a theatrical story telling. I’m such a fan of the new work they’ve done and from what I’ve gathered, audiences who went in thinking they’d be disappointed that there were changes, left ecstatic that they were able to breathe new life into the project. Some people have said this musical is for boys what Annie was for girls. Do you think that’s true or that it appeals to a much wider audience? I think it’s really great that there is a musical right now that speaks so strongly to young boys. I know growing up in the 90s, musical theatre wasn’t necessarily the coolest thing to be doing and having a show like NEWSIES where the boys are tough and athletic and cool is just thrilling. I think that girls can gain a lot out of the stage show too. One of the best changes to the Broadway show is the addition of the character, Katherine. She’s a female reporter trying to earn a name for herself in the workplace at a time when it was very difficult for women. We get to see her fight for women’s rights right alongside the boys fighting for their place at the table. I think it’s such a great message for girls to see someone standing up against the odds and doing something important. How do you and the cast warm-up before a show? Before the audience is let into the theatre the dancers take over the stage and do various stretches and warm ups. We also gather at the 5-minute call and hold hands and talk about the things we’re thankful for, basically to get us all on the same page. So much of the success of the show is dependent on communicating the comradery and passion amongst the newsboys to the audience. Knowing that, as a cast, we’re all taking care of each other. It’s vitally important that we make that happen. Have you heard if Christian Bale will be there on opening night? There’s no word yet on Christian Bale coming to see our show. I’d like to think that he’d be both impressed and honored to see what a great job we’ve done materializing one of his early films into something truly unique and crowd pleasing. For more information visit NewsiesTheMusical.com, Facebook.com/Newsies and Twitter.com/Newsies.